That emphatic win should make Hibs, now four points clear of tonight's visitors, strong favourites to win the Championship title and automatic promotion. The focus turns tomorrow to those battling for promotion play-off places - and to avoid relegation - with four more Championship games, plus a full card in League One and League Two. Join us for more live action from around Scotland tomorrow. Dundee United manager Ray McKinnon on BBC Radio Scotland: "I am really disappointed. That wasn't great from us and we conceded the game in the first 20 minutes. "It was really nervy at the start and they were really ragged. "We didn't deserve to get anything. We didn't pass it with any zip or purpose. You can now read Tom English's view of the match from Easter Road. 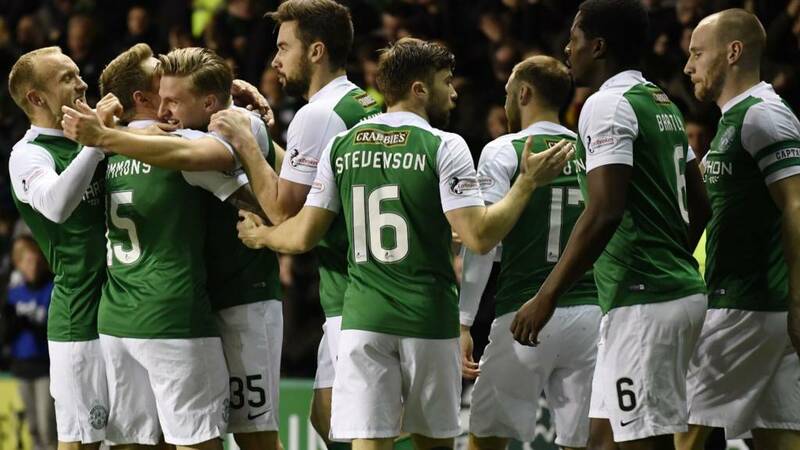 Jason Cummings scores twice as Hibs see off closest rivals Dundee United to open a four-point lead in the Championship. Former Scotland midfielder Kris Commons' loan spell from Celtic is ending in the coming days, but Hibs manager Neil Lennon is suggesting that he will look to extend that to the end of the season. Hibs manager Neil Lennon has gone on to describe Jason Cummings as "awesome" and says Chris Humphrey had a "great debut". Of the win, he says: "It's a tough league, but this gives us a bit of a cushion." The cheers ring round Easter Road as Hibs ease to victory over a Dundee United side that were never at the races. That's two defeats in a row for Ray McKinnon's side, who slip four points behind their impressive hosts at the top of the Championship. Martin Boyle is so close to gathering the ball behind the United defence to score a fourth as we prepare to enter two minutes of stoppage time. Tony Andreu's penalty gave United their win over Hibs last month, but the on-loan Norwich City man's frustration tonight is complete with a yellow card. Meanwhile, Hibs goalscorer Jason Cummings comes off to be replaced with Brian Graham. Former Hibs forward Tam McManus on BBC Radio Scotland: "That was vintage John McGinn. "What a substitute to be able to bring on. He is absolutely different class and has killed this game off. Game over." Tope Obadeyi is a threat again to Hibs and his low cross gives Cammy Smith a sniff at goal, but the forward is unable to backheel the ball home from close range. Hibs right-back David Gray goes into the referee's book. Chris Humphrey is given a standing ovation as the new signing's fine Hibs debut comes to an end and he is replaced with James Keatings. Hibs are on their way to a four-point lead as John McGinn, only seconds on the pitch following ankle surgery, waltzes into the penalty box and slots the ball through the legs of goalkeeper Cammy Bell from an acute angle. All with Scotland head coach Gordon Strachan watching in the stands. Three and easy for the Hibees. Mark Durnan is the latest United man to go into the book - for a foul on Marvin Bartley.